I absolutely love this profession! 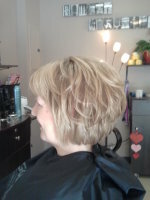 I have been a stylist for over 20 years and life just gets better and better! We have the best clients EVER! I have studied and worked with the best. 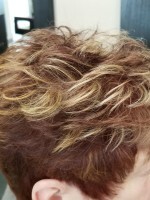 My specialty would be customizing and maintaining my clients color, cut, and style so that it works for you. 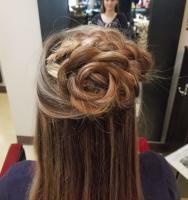 I also love formal hair styling for weddings and special occasions. 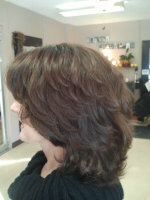 I also see the importance of weekly shampoo and styling. 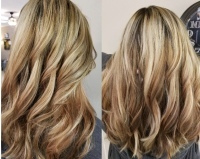 My color line of choice is Goldwell although I am proficient in many. Continuing education is very important to me as our profession is constantly changing. Giving back to the community is something that we believe strongly in as well. I am a married, mother of 2 grown, beautiful children, and I have been blessed with 3 handsome grandsons and a beautiful granddaughter. Our team here at Simplicity is just that. Great women in all corners! May your glass always be half full!